The Romans were renowned as great engineers and this is evident in the many structures that they left behind. 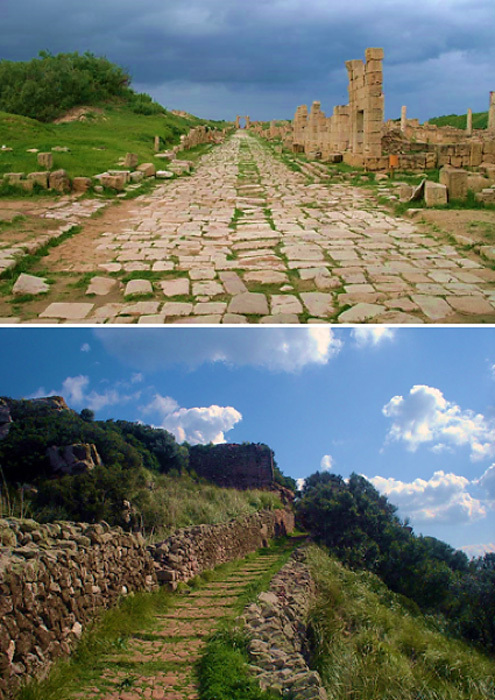 One particular type of construction that the Romans were famous for is their roads. 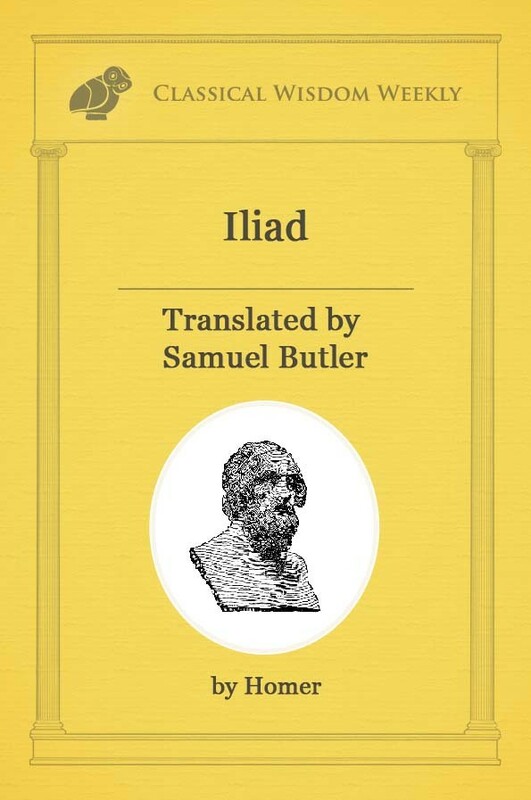 It was these roads, which the Romans called viae, that enabled them to build and maintain their empire. How did they create this infrastructure that has withstood the passing of time better than most its modern counterparts? It has been calculated that the network of Roman roads covered a distance of over 400,000 km (248,548.47 miles), with more than 120,000 km (74,564.54 miles) of this being of the type known as ‘public roads’. 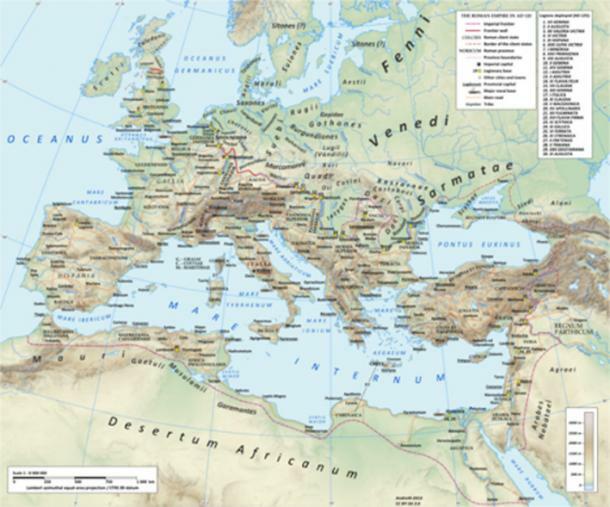 Spreading across the Romans’ vast empire from Great Britain in the north to Morocco in the south, and from Portugal in the west to Iraq in the East, they allowed people and goods to travel quickly from one part of the empire to another. The Romans classified their roads into several types. The most important of these were the viae publicae (public roads), followed by the viae militares (military roads), then the actus (local roads), and finally the privatae (private roads). The first of these were the widest, and reached up to 12 meters (39.37 ft.) in width. Military roads were maintained by the army, and private roads were built by individual landowners. There was no ‘one-size-fits-all’ Roman technique for building roads. Their construction varied depending on the terrain and the local building materials that were available. For example, different solutions were required to build roads over marshy areas and steep ground. Nevertheless, there are certain standard rules that were followed. Roman roads consisted of three layers – a foundation layer on the bottom, a middle layer, and a surface layer on the top. The foundation layer often consisted of stones or earth. 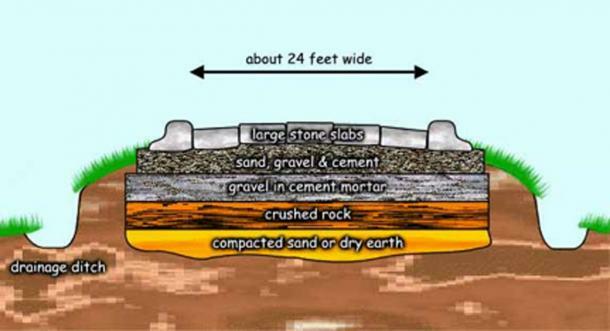 Other materials used to form this layer included: rough gravel, crushed bricks, clay material, and even piles of wood when roads were being built over swampy areas. The following layer would be composed of softer materials such as sand or fine gravel. This layer may have been formed by several successive layers. Finally, the surface was made using gravel, which was occasionally mixed with lime. For more prominent areas, such as those close to cities, roads were made more impressive by having the surface layer built using blocks of stone (which depended on the local material available, and may have consisted of volcanic tuff, limestone, basalt, etc.) or cobbles. The center of the road sloped to the sides to allow water to drain off the surface into drainage ditches. These ditches also served to define the road in areas where enemies could use the surrounding terrain for ambushes. 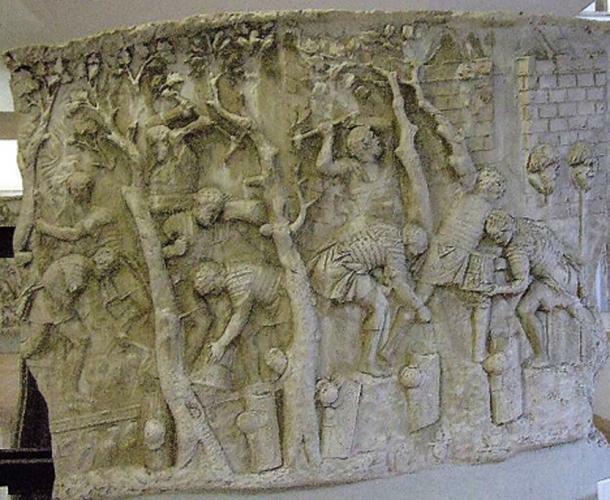 Roads played a crucial role in the Roman Empire. For a start, the roads allowed people and goods to move swiftly across the empire. For example, in 9 BC, using these roads, the future emperor Tiberius was able to travel almost 350 km (217.48 miles) in 24 hours to be by the side of his dying brother, Drusus. This also meant that Roman troops could be deployed rapidly to various parts of the empire in the event of an emergency, i.e. internal revolts or external threats. Apart from allowing the Roman army to outmaneuver their enemies, the existence of these roads also reduced the need for large and costly garrisons throughout the empire. In addition to serving a military purpose, the roads constructed by the Romans also enabled trade and cultural exchange to occur. The via Traiana Nova (known before that as the via Regia), for instance, was built on an ancient trade route that connected Egypt and Syria, and it continued serving this purpose during the Roman period. 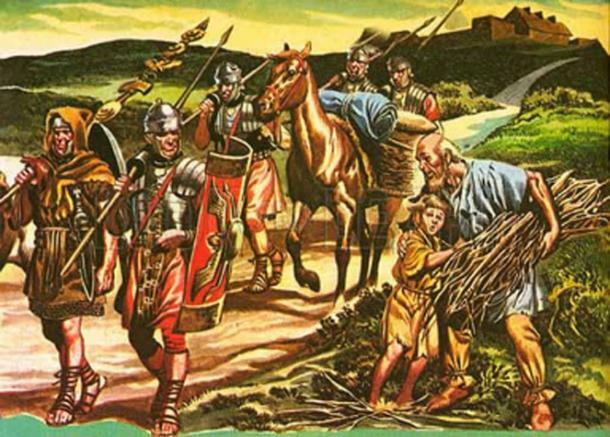 One of the factors that allowed such roads to facilitate trade is the fact that they were patrolled by the Roman army, which meant that merchants were protected from bandits and highwaymen. 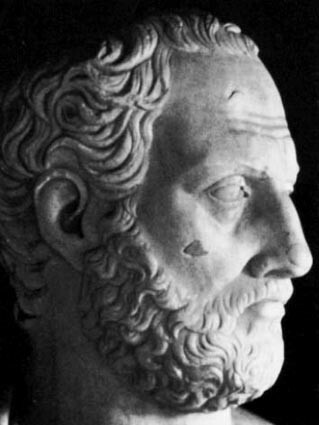 Another function of roads in the Roman world is perhaps an ideological one. These roads may be interpreted as a mark left by the Romans in the landscape, signifying their conquest of the terrain and the local population.